I am little late posting. 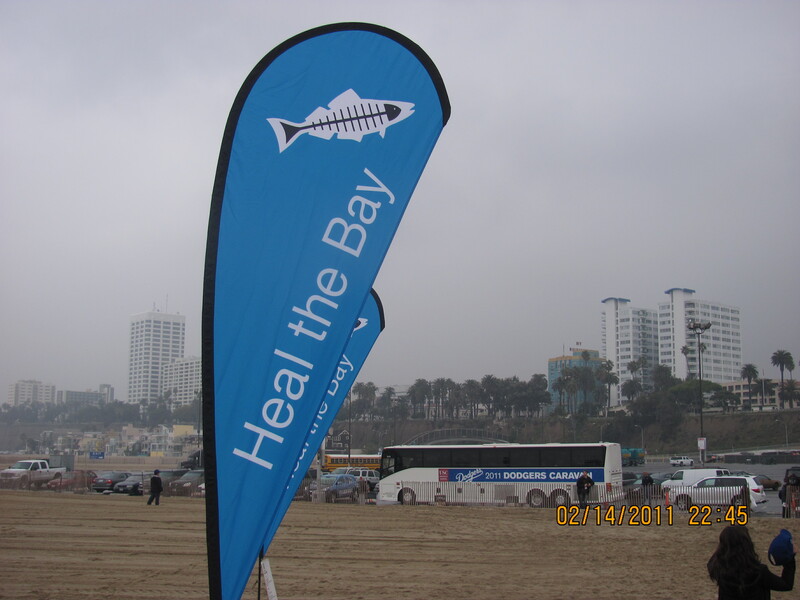 Day two of the Dodgers Community Caravan for the Think Blue, act Green location was Santa Monica for “Heal the Bay” Day. 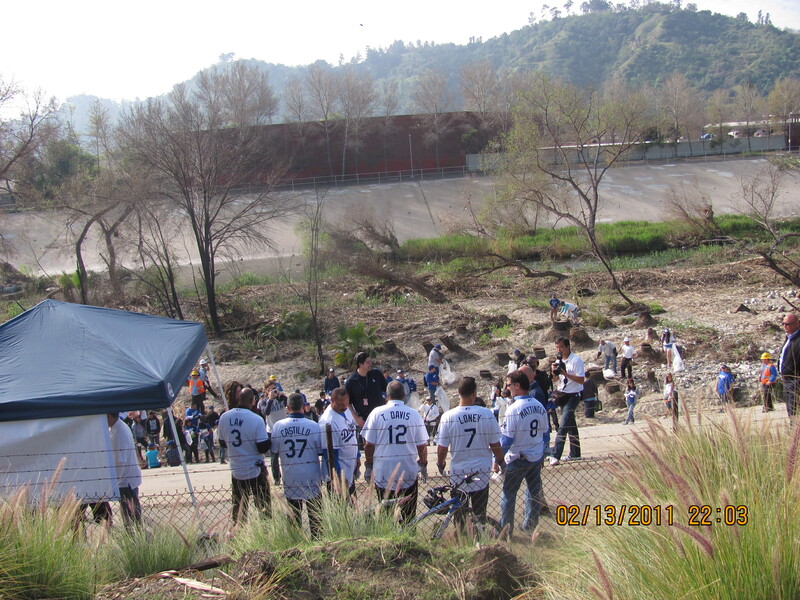 Notice the Dodgers 2011 Caravan bus in the background. In attendance were Shawn Green, Steve Garvey, Matt Kemp, Rafael Furcal, Jay Gibbons, Gabe Kapler, Tony Gwynn, Fernando Valenzuela, Sweet Lou Johnson, Darryl Thomas and Charlie Steiner. 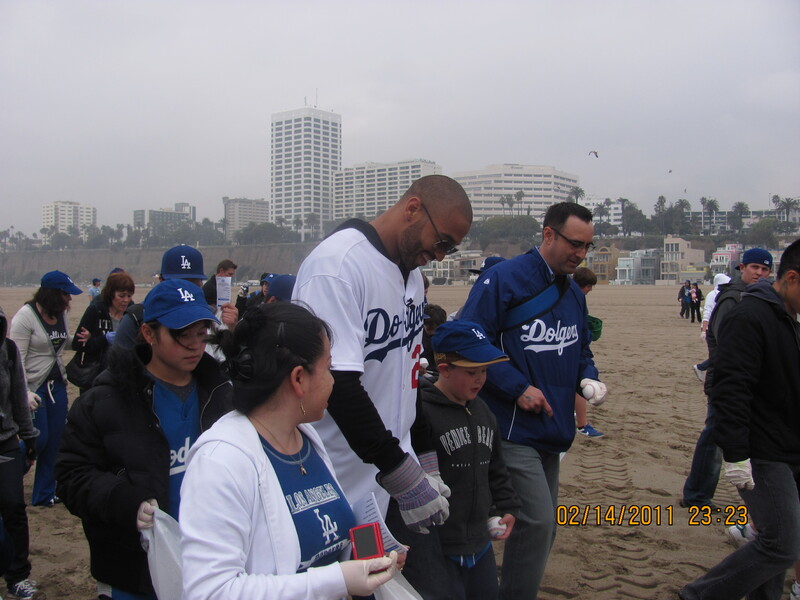 Matt Kemp sure had an alot of followers. When I told him he looked thinner, he said “Yeah?, I’ve been working out”. Tonny Gwynn Jr. said his dad is doing better recovering slowly from his bout with cancer. 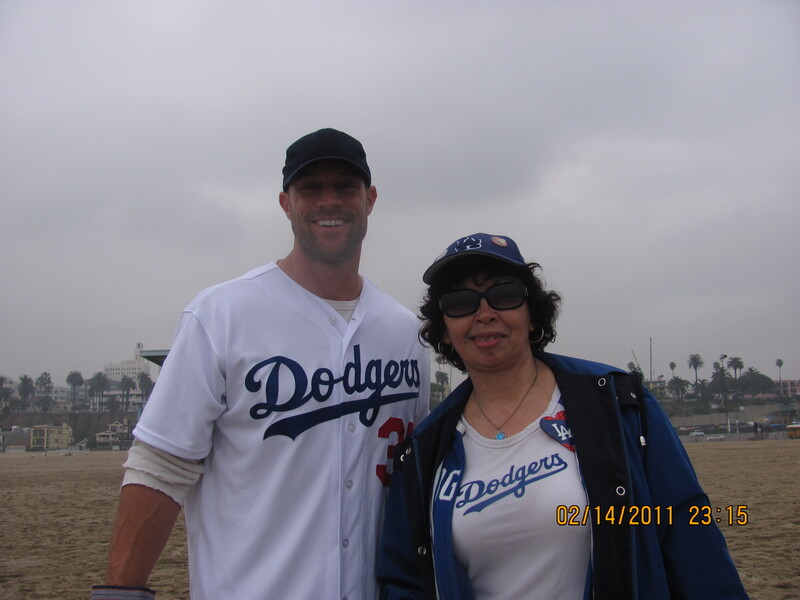 Shawn Green is back! When asked about his book, he said it comes out in June. We caught a little rain in Santa Monica but everyone’s spirit was high! 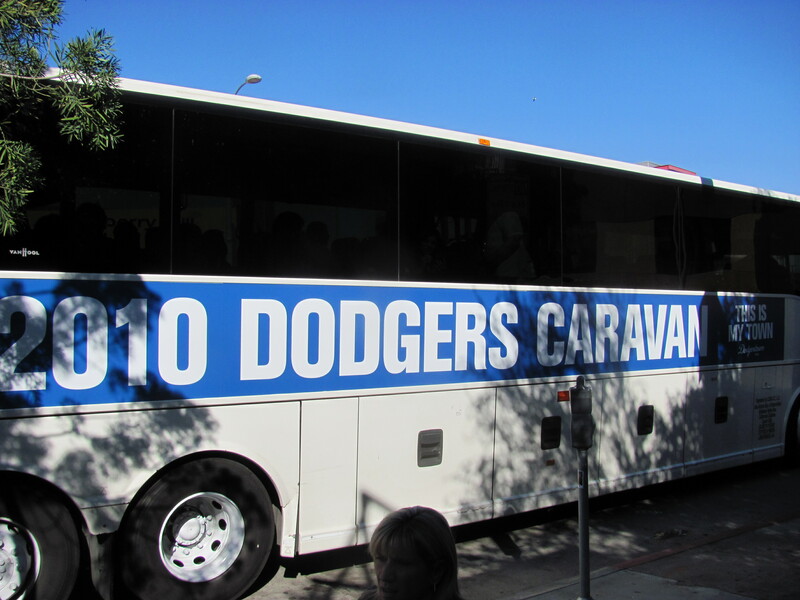 I commend the Dodgers for this year caravan! The Think Blue and Act Green theme was a great idea. 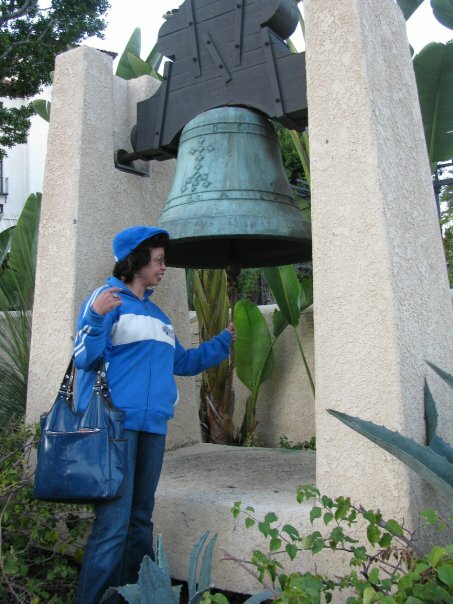 On a sad note, we lost another Dodgers player. Gino Cimoli died last Saturday of kidney and heart complications. He was 81. 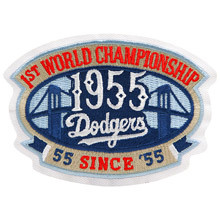 The number of living-Brooklyn Major Leaguers is down to 50. Spring is in the air! Check out the flowers outside where I work. They are called Magnolia Alexandria. The Dodgers Caravan will be February 14th to the 15th! 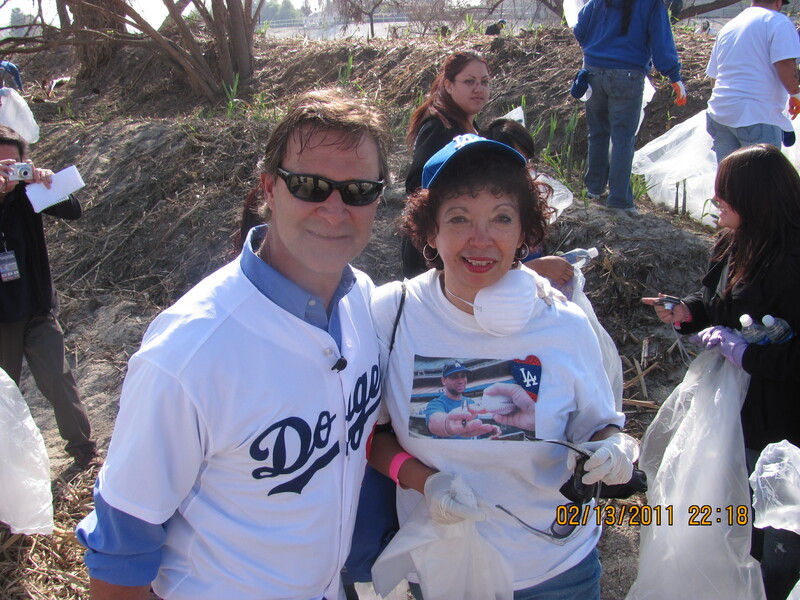 This year is full of community work where the fans get to join in!. My friend Lorena, Erik and I are thrilled that we were able to signed up for both days. 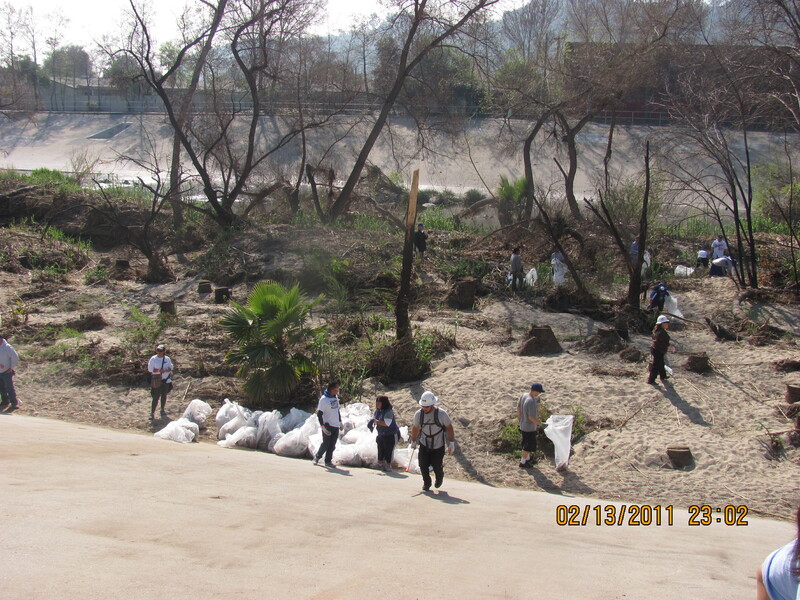 February 14th it will be Cleanup our LA river and February 15th, cleanup the Bay (Santa Monica). I can’t wait! 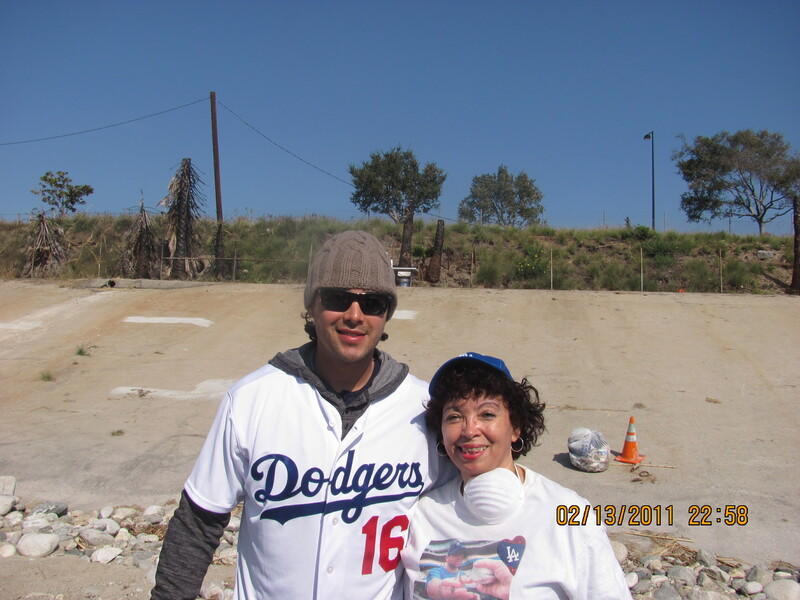 Dodgers will also be at the Lopez Tonight show in Burbank on Valentines Day but I could not get tickets to that. Can anyone get us at the Warner Bros studios on that day? I used to know someone that used to get me VIP tickets but that person moved out of state. My friend Lorena and started talking Spring Training games when we met at the Laker game last night. Yeah, Lakers lost to the Spurs but we had a good time. 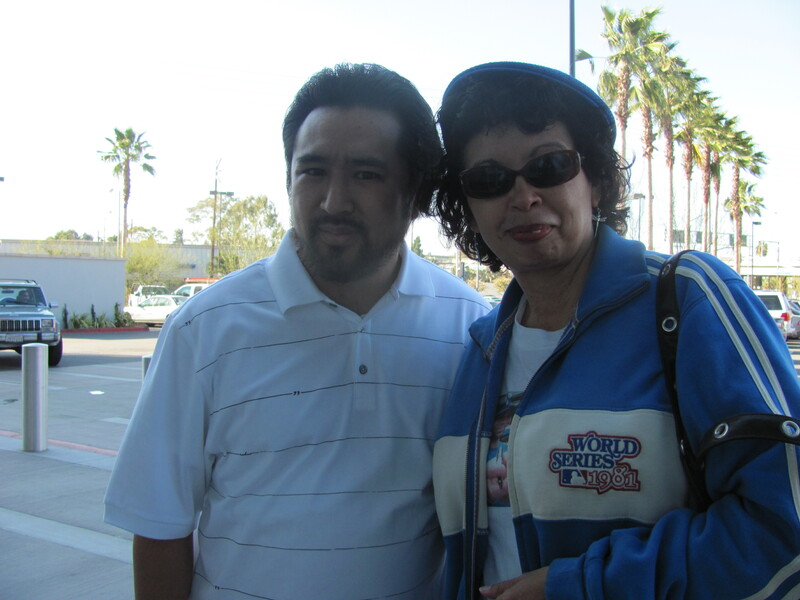 We along with friend Margie decided on the first two games at Camelback Ranch. The first game is Sunday February 27th against the Angels and Monday against the White Sox. We might get there on Saturday or early Sunday. I can’t wait! from the adoption site at www.heartgalleryla.org. 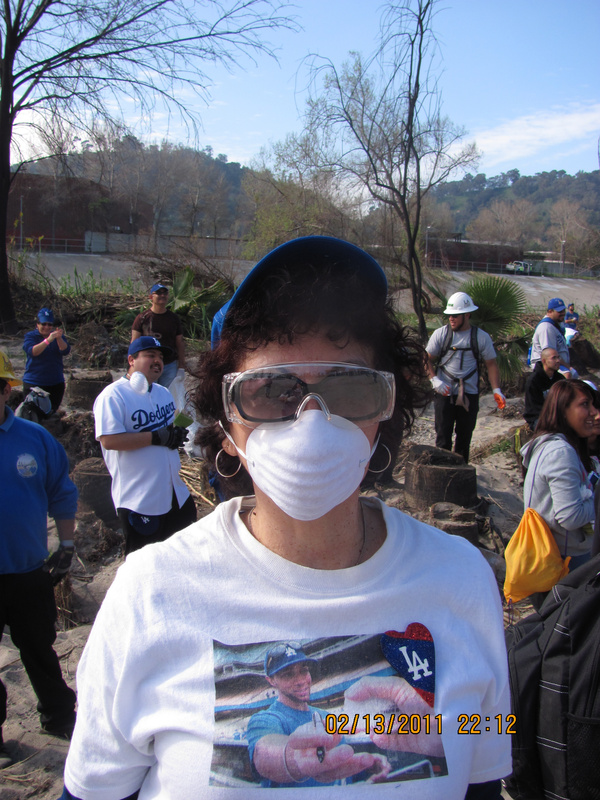 PLEASE click on the link above, then the video of the Dodgers salute to the Heart Gallery of Los Angeles in their pursuit to find homes for children. 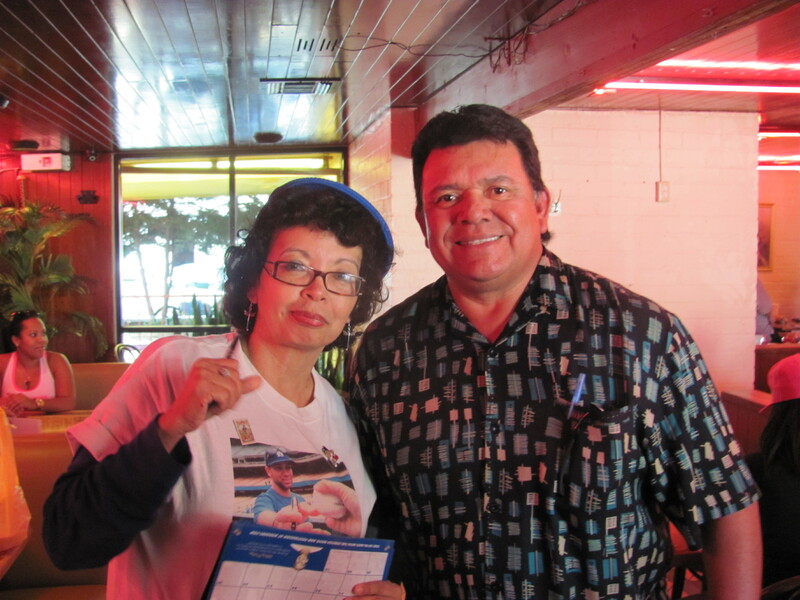 This is the second year the Dodgers team up with the Heart Gallery of Los Angeles doing the Calendar. According to Josh Rawitch, Dodgers Vice President of Communications, the Gallery has had a high rate of success since the kids have been featured on the Team calendar. 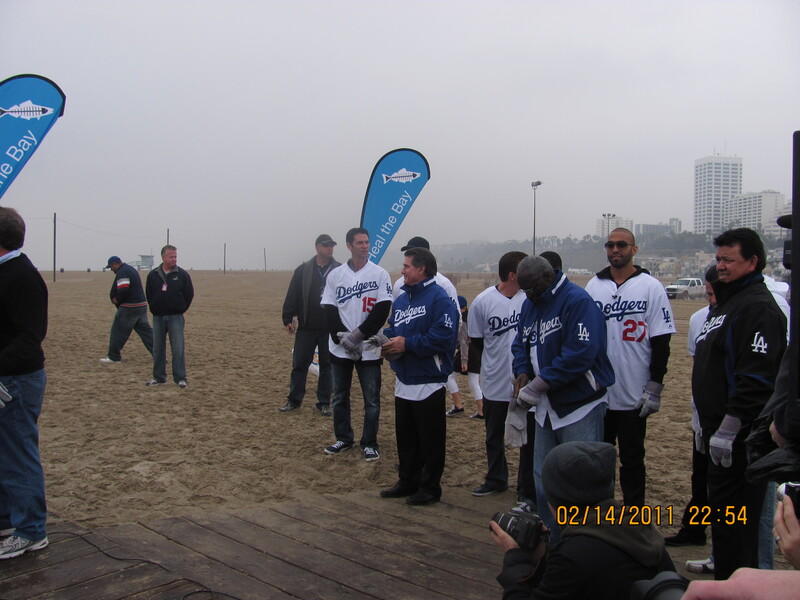 Dodgers Caravan 2010 2nd part. First of all I want to give a BIG THANK YOU to all that participated in the Dodger Caravan and to all those that helped put the event together and those that worked the long hours from the morning event at the Children’s hospital event, to Roscoe’s Chicken and Waffles luncheon, to Best Buys to play video games with the fans and sign autographs to going to Olvera Street in the evening! I could see how tired some of you look so THANK YOU SO MUCH for all your hard work! Ok, on to some more pictures! El Senor Jaime Jarrin, the voice of the Dodgers in Spanish! He is just a class act! 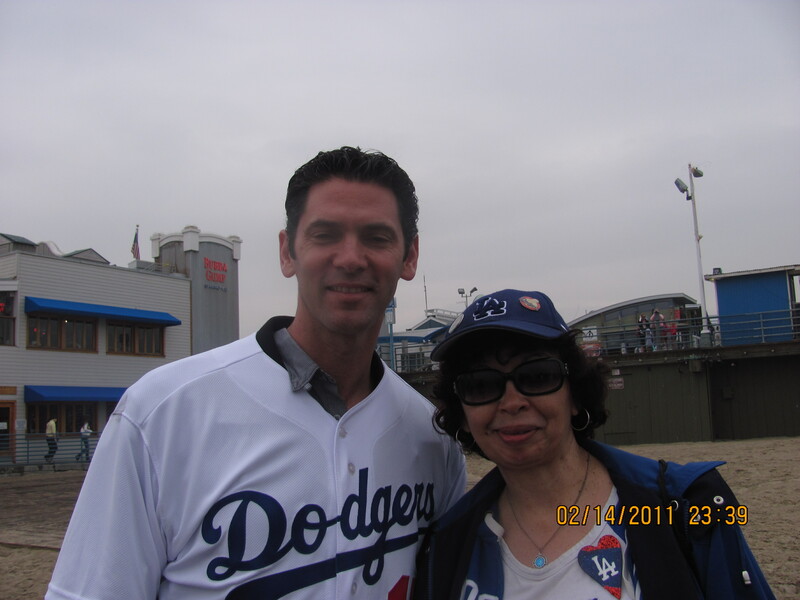 This will be his 51st year with the Dodgers! 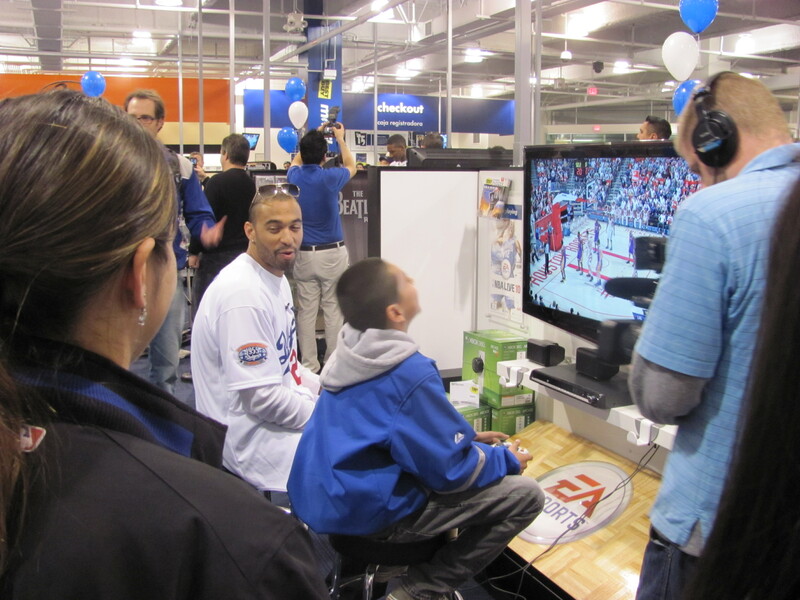 Matt Kemp at Best Buys playing games with a young fan. 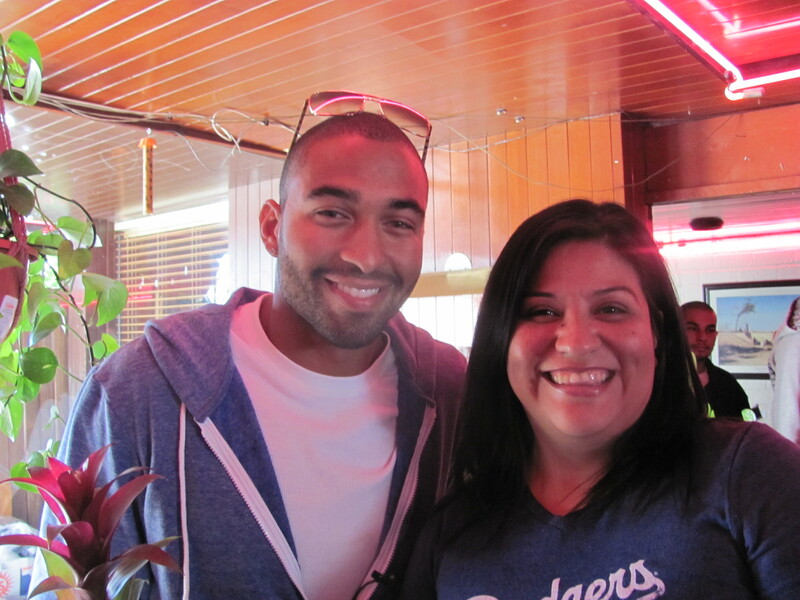 We made quite an impression on Matt Kemp that he said at Best Buys “”Hey, you guys made it here too!”. We had an unforgettable day! 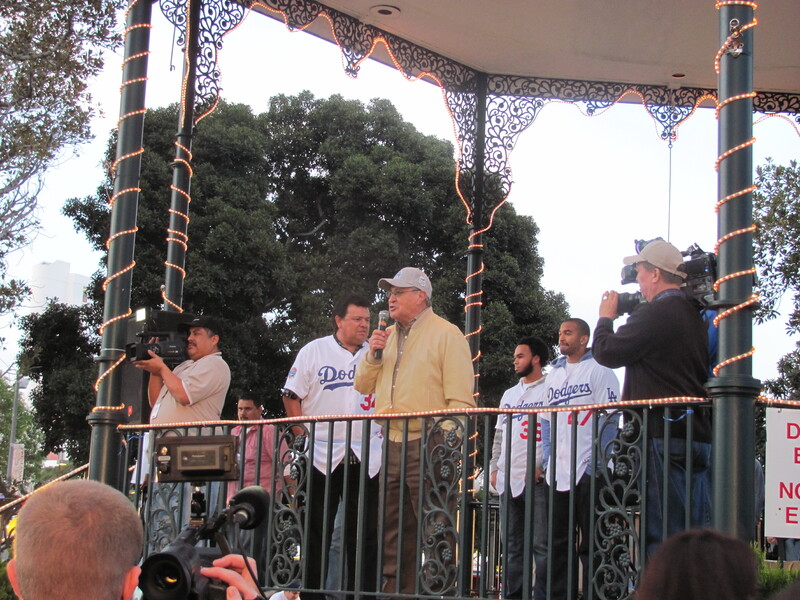 Jaime Jarrin taking the mike en la Plaza de Olvera Street. Everyone have a wonderful Sunday. I am heading to the hospital to visit tia Marina for her birthday celebration with a Mexican trio singing to her in the lobby. 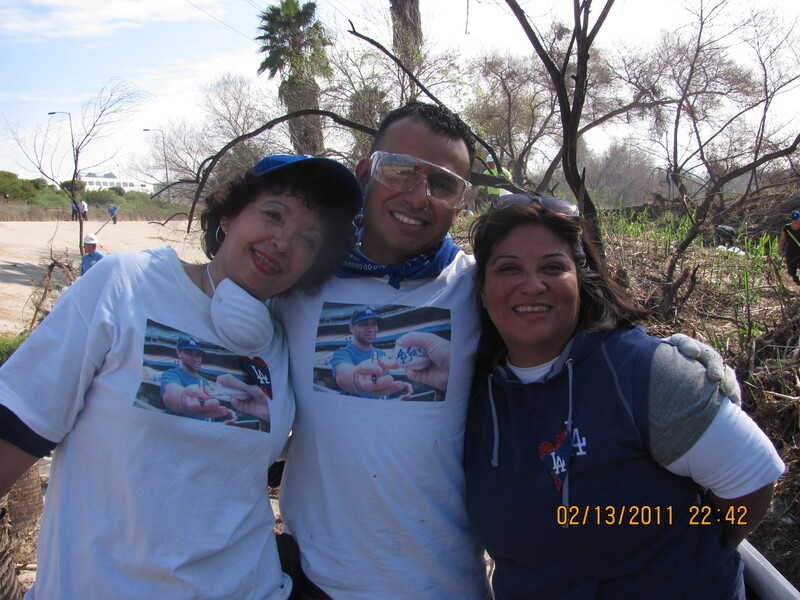 Thank you to my friends Erik, Lore (LTD23) and Elisa for contributing to a great day! Wednesday my friends and I went from Roscoes Chicken and Wafles at Pico in Los Angeles, to Best Buys near the airport to Olvera Street in Downtown L.A. 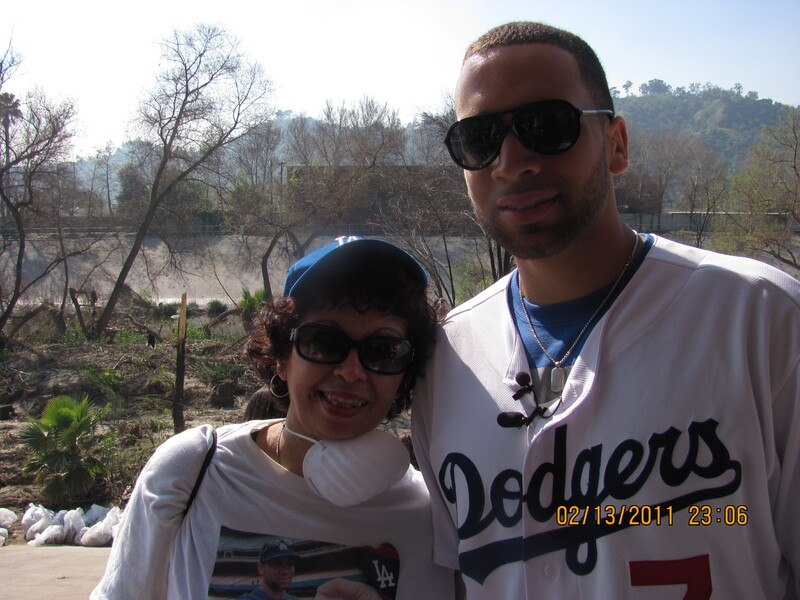 Originally James Loney was supposed to be part of the Caravan but he was a late scratch. The Dodgers that attended on Wednesday were: Matt Kemp, Fernando Valenzuela, James McDonalds, Ramon Troncoso, Jim Campanis and Steve Yeager and Hall of Famer Jaime Jarrin, the voice of the Dodgers in Spanish!. It was great to meet up with my friends Erik, Lorena and her niece Elisa. Loney: We missed you at the Caravan! Guess who crashed the party at Roscoes Chicken and Wafles? That is Barry Bond! My friend Lore was able to take this picture. Someone was saying that while we were waiting to get in that Lady Gaga was inside Roscoes. 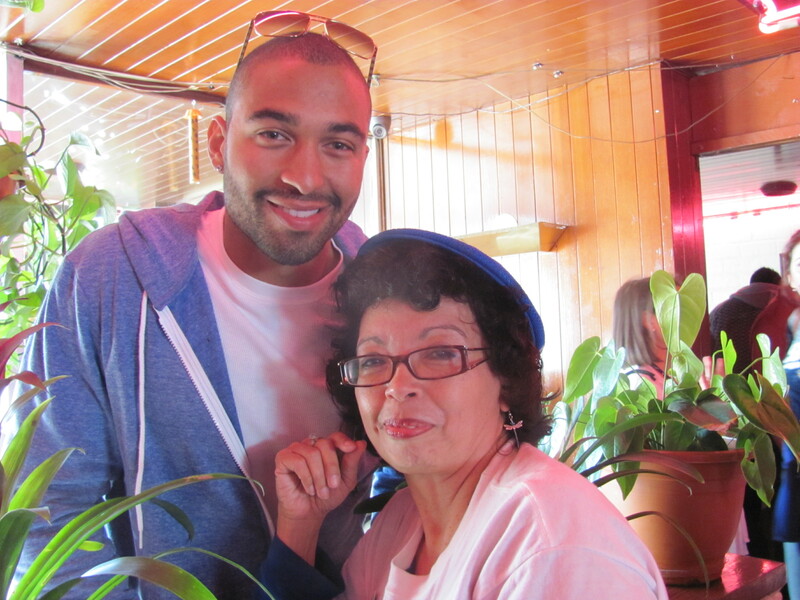 Here is Lore with Matt Kemp. I love this picture! 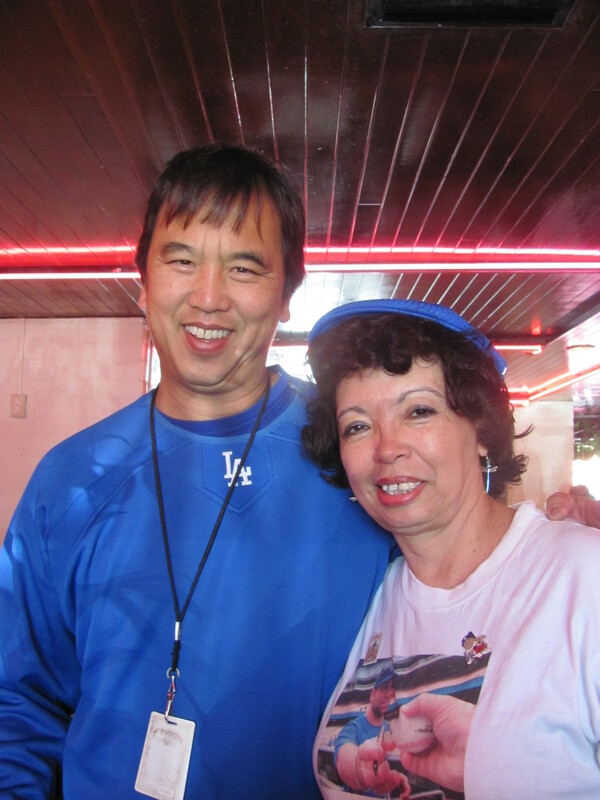 Meet Jon Soo Hoo, the Dodgers great photographer! The boys are playing games at Best Buys. Matt Kemp said to us: “Hey you guys are here too “. He also greeted us at Olvera Street. At the Plaza of Olvera Street in Downtown L.A. The lines were huge when we got there but we had already talked to the guys at Roscoes so it was OK with us. We justed wanted to be there to support our Boys in Blue! 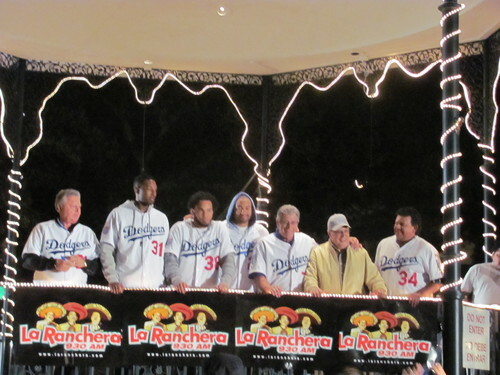 From Left to right, Jim Campanis, James McDonals, Ramon Troncoso (Tron), Matt Kemp, Steve Yeager, Jaime Jarrin and Fernando. We watched all the boys sign and took more pictures. 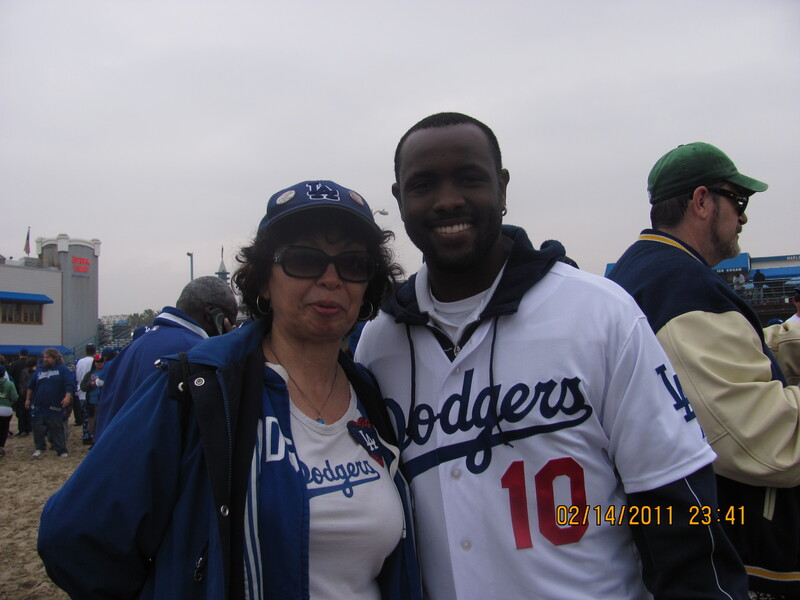 Ran into Pat,Jo, Roberto, Jack and other Dodger fans there. Afterwards we went to El Paseo for dinner. Pat, Jo and a friend of them came in later and had the table next to us. Since Pat had told me at Olvera Street that it was her birthday, I called the trio that was singing there and had them sing “Las Mananitas” to her. Las Mananitas is the tipical song sang on your birthday, right after singing it they went into the Happy Birthday song. After dinner, Erik and I walked Lore and her niece Elisa to their car. Mine was across the street but both Erik and I were craving a cup of coffee so we walked across to Philippe’s. Philippes has been around for 102 years! http://www.philippes.com/ The coffee tasted so good! and the price, can you believe it costs 10 cents ! 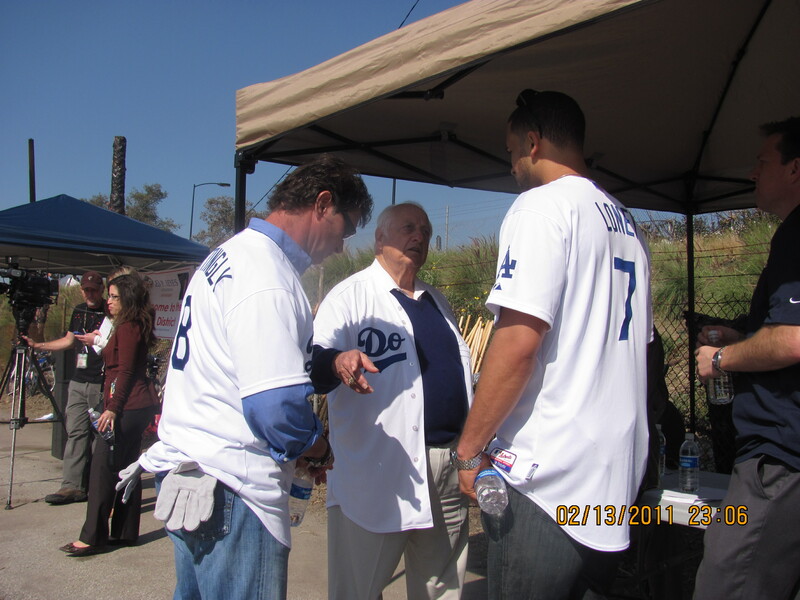 I had a wonderful time at the Dodgers Caravan and I put a post in the ITD blog to let Josh Rawich know. 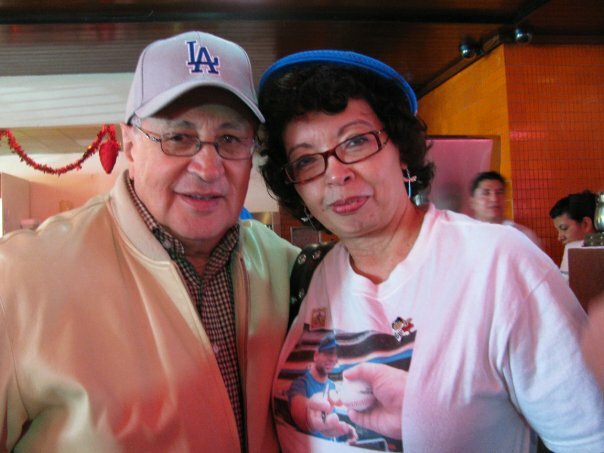 Everyone from the current to the past Dodger players in attendance to Jaime Jarrin to the Dodger workers that were there helping the event were wonderful. They had a long day since their day started with a trip in the morning to the Children’s hospital and it did not end until very late at night at Olvera Street. You could see the fatigue on some of their faces from the long day but they were being troopers still smiling. A BIG THANK YOU TO ALL !!!!!! A big THANK YOU also to my friends Erik, LTD23(Lore) and Elisa! I miss you all during the offeseason so it was great seeing you again! This is the third year we do this! Let’s do it again next year! Dodger Caravan! Happy birthday dad. Dodger Caravan has been announced! The Los Angeles Dodgers will embark on their annual Dodgers Community Caravan presented by USC University Hospital on Monday, February 1 – Wednesday, February 3. The Caravan will kick-off with a stop at USC University Hospital with visits from Dodger Legends and broadcast personalities. On Tuesday and Wednesday the Caravan’s first visit each day will be the two hospitals that are partners in the ThinkCure effort, City of Hope and Childrens Hospital Los Angeles. Each day will also provide fans with an up-close-and-personal opportunity to meet and hear from the Caravan members, participate in question-and-answer sessions, see demonstrations of professional baseball skills, procure autographs, win fabulous prizes, sign up for the free Kids Club Jr. Dodgers, purchase season ticket packages and Camelback Ranch-Glendale spring training tickets from the Dodgers ticket truck and, most importantly, take an offseason step toward getting ready for the 2010 Dodger season. Featuring: Andre Ethier and Hiroki Kuroda. More names to be added. 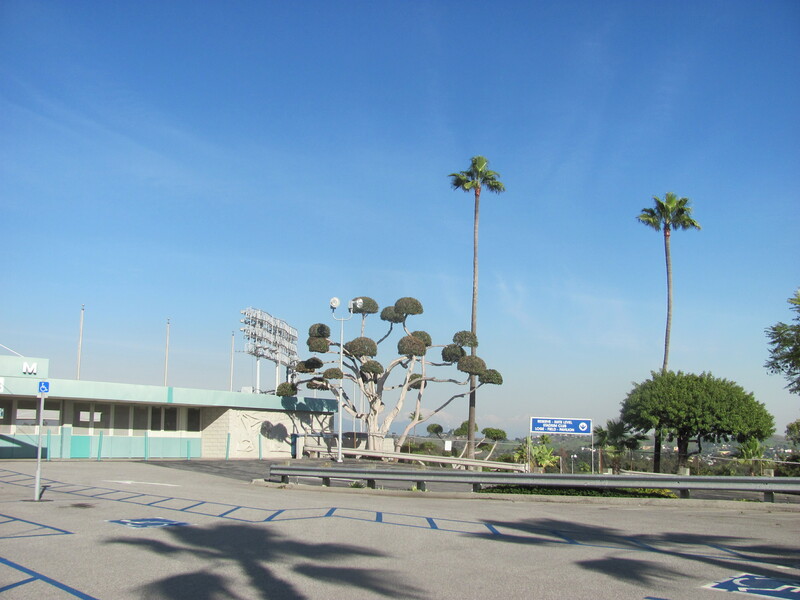 Trader Joe’s – Hastings Ranch, 467 N. Rosemead Blvd., Pasadena – 1:45 p.m. – 2:45 p.m.
Dodgers Dreamfield Dedication Ceremony at Los Angeles Boys & Girls Club, 2635 Pasadena Ave., Los Angeles – 3:15 p.m. – 4:15 p.m.
ESPN Zone @ L.A. LIVE, Downtown Los Angeles across from Staples Center, 5:00 p.m. – 6:30 p.m.
First Eighty fans in line will have the option to have priority seating for dinner in the screening room where the autograph signing will be held. Guests will be seated in groups of four. If you choose the dinner seating each individual must spend $20 on food & beverages. You will receive a $25 game card to use at ESPN Zone @ L.A. Live and be first to get your autographs at 5:00 p.m. Featuring: Matt Kemp, James Loney, James McDonald, Ramon Troncoso and Fernando Valenzuela. More names to be added. Roscoe’s, House of Chicken and Waffles, 5006 West Pico Blvd. (near La Brea)- 12:30 p.m. – 2:00 p.m.
Best Buy, Westfield Culver City Mall, 6000 Sepulveda blvd. Ste. 1240, Culver City – 3:00 p.m. – 4:15 p.m.
2010 Dodgers Rally at Olvera Street, East Cesar E Chavez Avenue & Olvera Street, Los Angeles – 5:00 p.m. – 6:15 p.m.
*All featured guests are subject to change and times listed at the “Open to the Public” and “Open to Customers” events are ballpark timeframes which may vary slightly. The open to the public events provide the best opportunities to meet players and receive autographs. 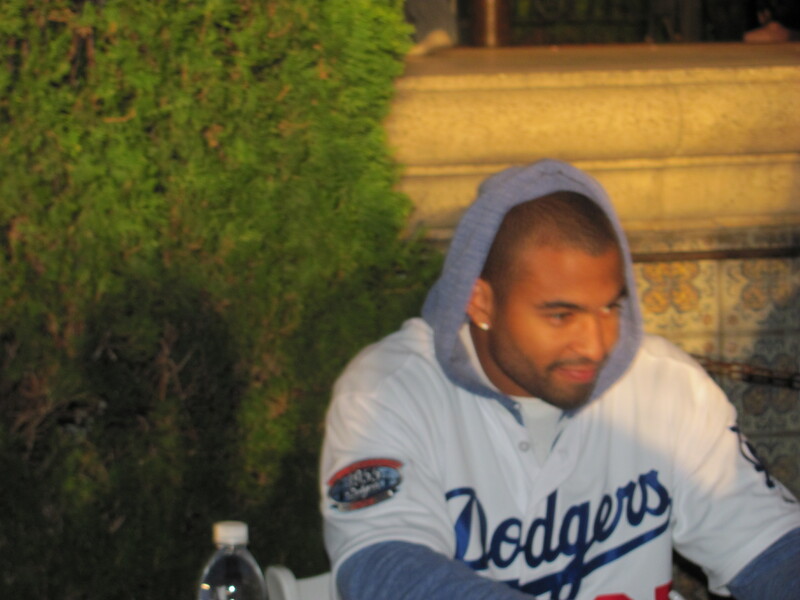 Fans should keep in mind, however, that even though the Dodgers will limit the number of autographs a fan can receive to ensure that as many are accommodated as possible, the club cannot, of course, guarantee everyone an autograph, as attendance will determine the number of fans the Dodgers can accommodate. The Dodgers will also hand out a limited quantity of Dodger promo items and ticket vouchers to fans in attendance at Trader Joe’s, Dodgers Dreamfield Dedication Ceremony at Los Angeles Boys & Girls Club, ESPN Zone @ L.A. LIVE, Roscoe’s, House of Chicken and Waffles, Best Buy and Olvera Street. Happy birthday dad. My dad Pedro would have been 79 today January 23rd. He passed away 5 years this June. My mom passed away when I was three. How hard it must have been for dad to lose her with two kids to take care. I had this picture painted from black and white pictures. The painter did an incredible job.